What is the value of a good story? What makes the D&D brand compelling? What makes it valuable? The game is valuable because it is a system of creating emotional meaning to the players (players find it fun and enjoy playing). The best DM’s are those who can invest meaning in the worlds they create and then use that meaning to emotionally affect the players. Likewise the best games are those that can invoke an emotional response. The best way to do that is to create a meaningful game world. How much is a good story worth in game design? This Fast Company article discusses ways to measure the value of a good story in quantifiable amounts. Without this kind of research it would be impossible (and has been difficult) to really value the kind of ‘Good Will’ generated by branding. Usually you pay X number of dollars to someone to create a brand, so on the balance sheet you record it as being worth X. But often the value of a good story is worth more than simply the cost of creating that story. Ultimately product branding in the real world is not much different from great storytelling. Take an object, say a stapler. Not terribly valuable until you need to fix two pieces of paper together. 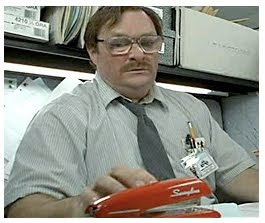 But what if that stapler on my desk is a Red Swingline Stapler? That red Swingline stapler (something which was not on sale before the move Office Space) was so compelling it became a product you can buy. Normal object + meaningful story = increased sales of staplers. How does a game company measure the value of the story the game designer has created? This work directly applies to game companies because it allows the business end of the company to evaluate the value of the developers in a more resolute way then they have been able to in the past. Imagine trying to calculate the value of the HALO story. Not the franchise, the story. How much should you charge if someone else wants to license the intellectual property you have created? Imbue your games with good stories and you make them intrinsically more valuable. Leave off storytelling and you run the risk of having a great game mechanic that no one is really interested in. It would be fascinating to see a company A/B test this in the online marketplace. How would you design the experiment to reveal the value of a story in your game?